25% of sales will benefit the Fiesta Especial Royal Court. and gowns worn by the 2014 Fiesta Especial Royal Court. The Fiesta Especial Royal Court creates visibility for the leadership and contributions individuals with disabilities make in this community every day. Shop for designer clothing at a fraction of the cost of other resale stores. Donate a bra...give a woman a job. It's that simple! Bring your broken, old, out dated and unworn gold to sell to the onsite Gold Buying Girl. 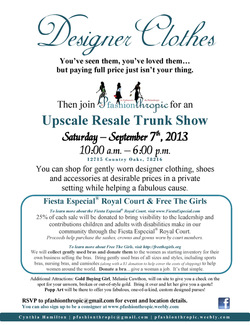 10% of the price your gold is purchased for will be donated to the Fiesta Especial Royal Court. Browse the display of one-of-a-kind, custom designed hand bags by Popp Art. Email Melanie Cawthon for more information about this event. I will attend the event to look for great buys! I would like to consign some items in the show. I am interested in selling my gold. Be prepared to give me a quote! I am unable to attend, but would love to know about upcoming events like this one.